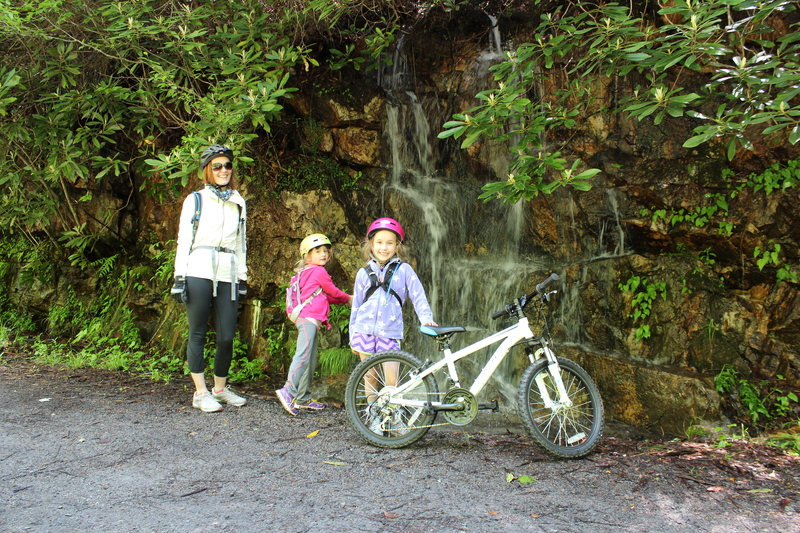 Last Friday we took the girls out of school early, loaded the bikes on the car and made our way the furthest south we have ever been since moving to “the south”. Our destination was Hungry Mother State Park, one of the original six state parks built by the CCC during the Great Depression. 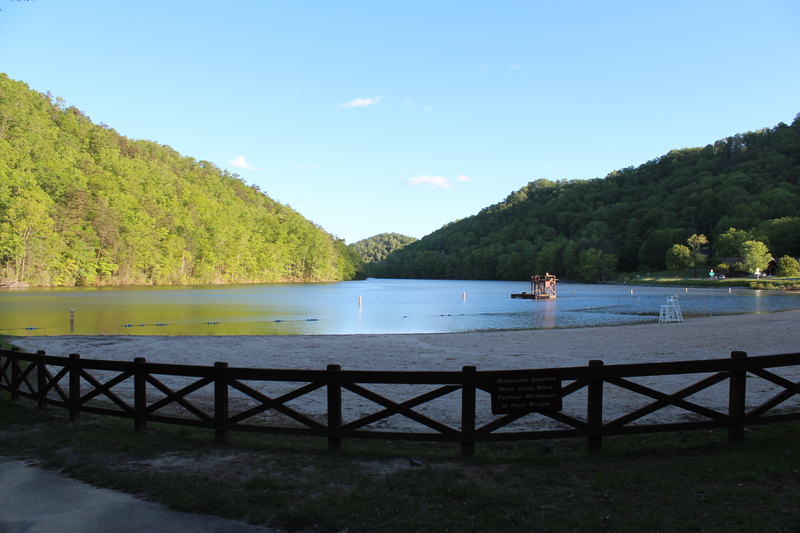 Hungry Mother is a popular family getaway as it is surrounded by beautiful trees, has a 108 acre lake in the heart of the mountains, a sandy beach, camping grounds, cabins, fishing spots and biking trails. Looking across the lake from the beach at Hungry Mother State Park. According to legend, when Native Americans destroyed several settlements along the banks of the New River , a woman named Molly Marley and her small child were among the survivors captured by the raiders and taken to their base north of where the park is situated. Molly and her child escaped and wandered on through the wilderness surviving on only the berries they found along the way. Molly eventually collapsed but her child bravely soldiered on, wandering down a creek until he found help. The first words he uttered on encountering help were “Hungry Mother”. By the time the rescuers reached the foot of the mountain where Molly had collapsed, she was dead. This mountain is now known as Molly’s Knob. We’d chosen to stay in one of the cabins. It was very cute – nestled in the trees and equipped with everything we could need. We cooked a quick dinner and headed for bed as we had to be up early for our adventure on Saturday. Warming up at the start of our big day with cups of hot chocolate. We were up and out the door early on Saturday morning, heading for the town of Damascus – and no there weren’t any great religious epiphanies along the way! 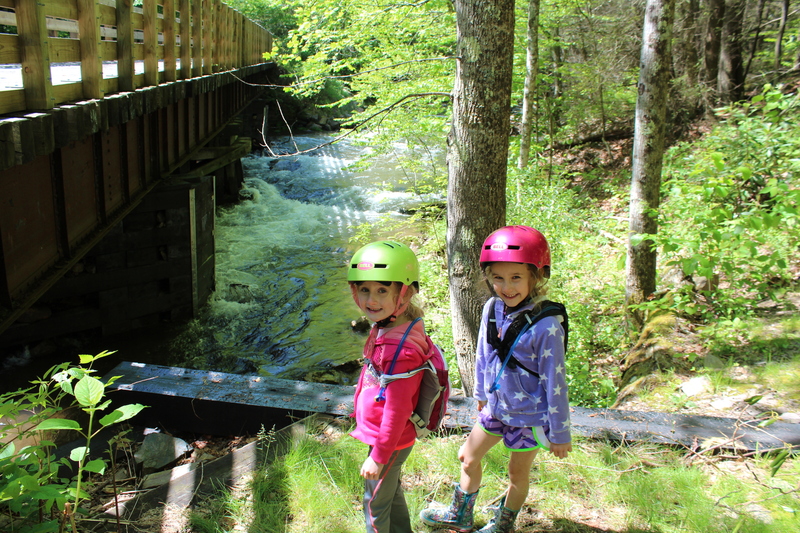 What’s important about Damascus – or Trail Town as it is often referred to – is that four scenic trails converge there. 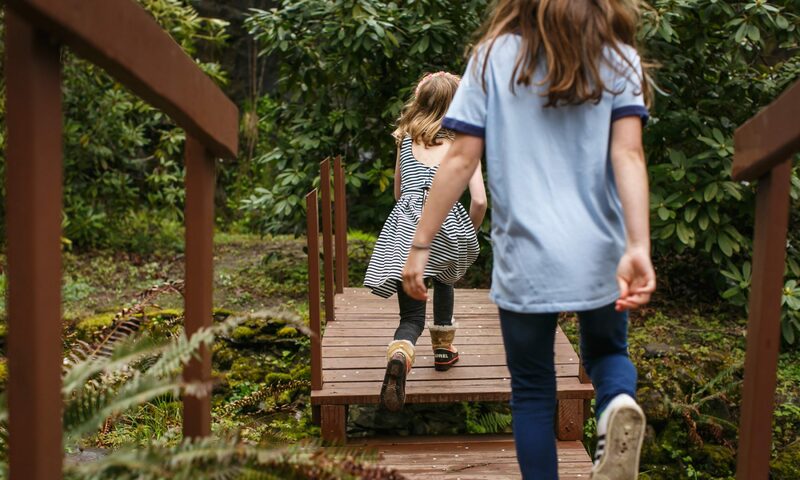 The Appalachian Trail, US Bicycle Route 76, the Iron Mountain Trail and the Virginia Creeper Trail, all cross paths in this tiny town of only 981 official residents. 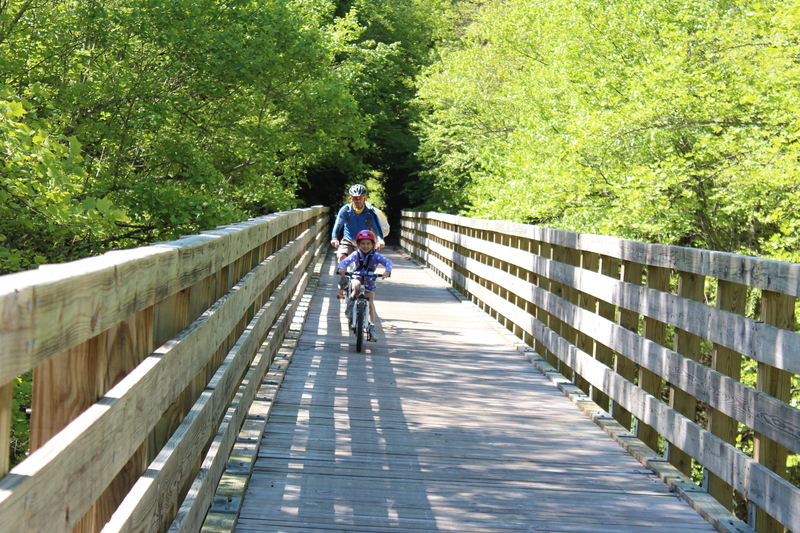 We had our sights set on the Virginia Creeper Trail – a 35 mile hiking, cycling and horse riding trail – that up until 1977 was a railway line. Most of the businesses in Damascus were bike hire and bike shuttle operations. 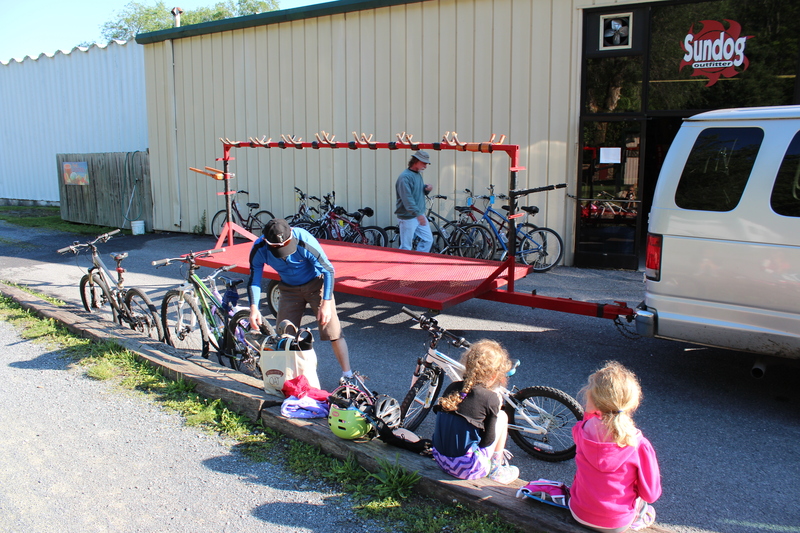 Here we are waiting for our bikes to be loaded on to the trailer for our ride up to Whitetop where we would start our descent. It took about 25 minutes to drive up to Whitetop and from there we had about 13 miles of downhill riding ahead of us. Once you got started you really didn’t need to pedal, so it made for a very relaxed and enjoyable ride. We took lots of breaks along the way to admire the scenery. It was beautiful. The trail follows along next to Laurel Creek and there are several bridges to cross whilst coasting down to Damascus. Olive rode the whole trail by herself. Here she is crossing one of the bridges. 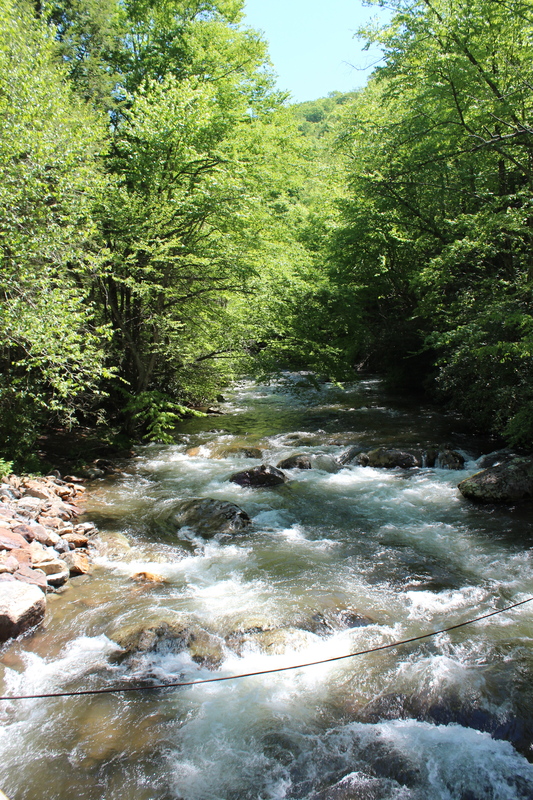 It was great to hear the creek rushing by as we cycled along. 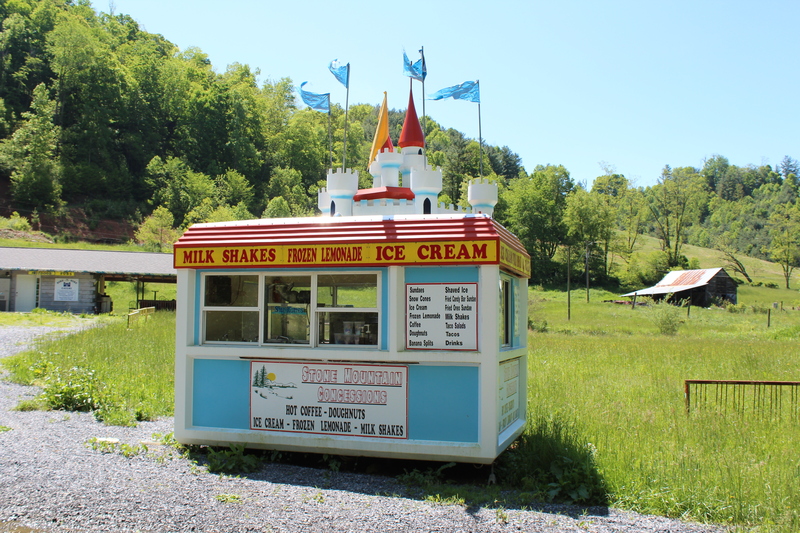 We stumbled across this very cute ice cream shop about halfway along the trail. Unfortunately it was closed. 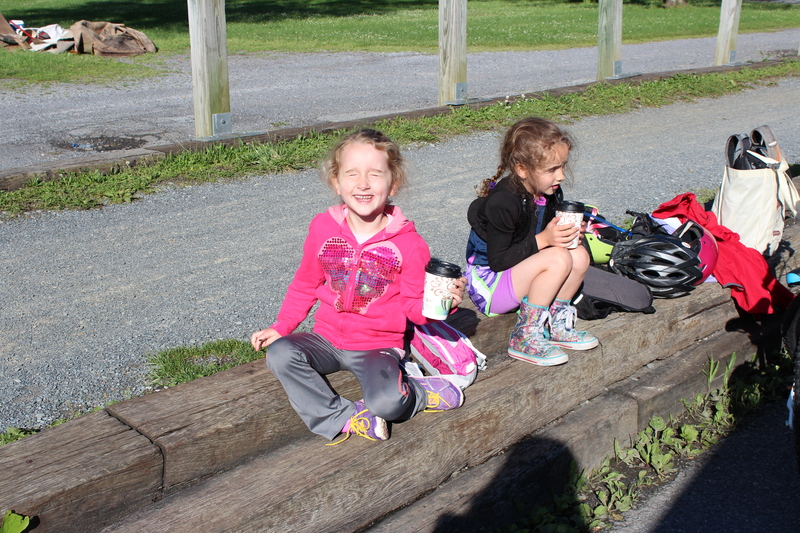 There was an open ice cream store conveniently located at the end of the trail and it was full of cyclists refueling after their tough downhill ride. 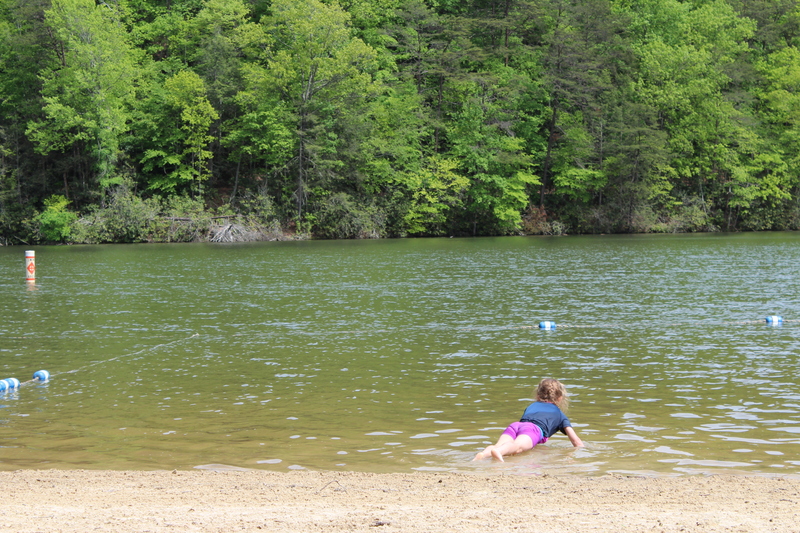 We headed back to Hungry Mother so that the girls could play on the beach and have a dip in the lake. It was Memorial Weekend in the US – the weekend that traditionally signals the start of summer – so it was the first day of business for many public pools and beaches. Olive playing around in the lake. 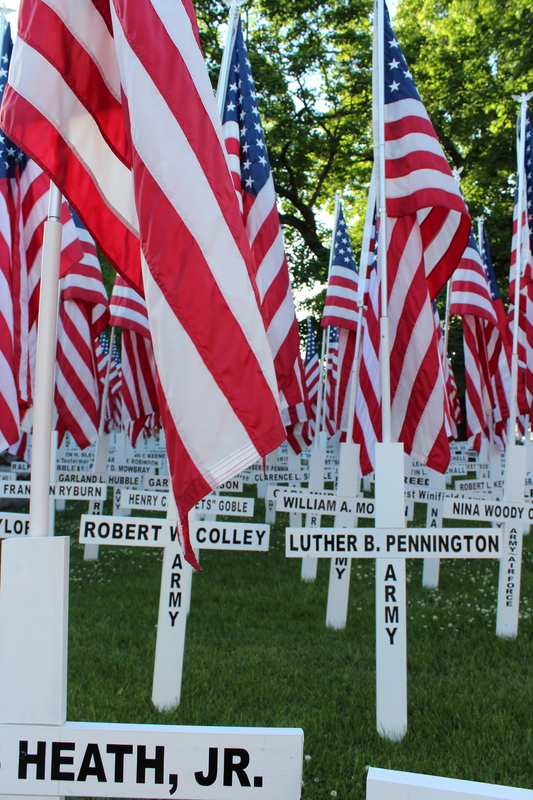 The other important part of Memorial Weekend – remembering the men and women who died whilst serving in the US Armed Forces. We headed back to Winchester on Sunday morning as we’d been invited to a Memorial Weekend pool party later that day. 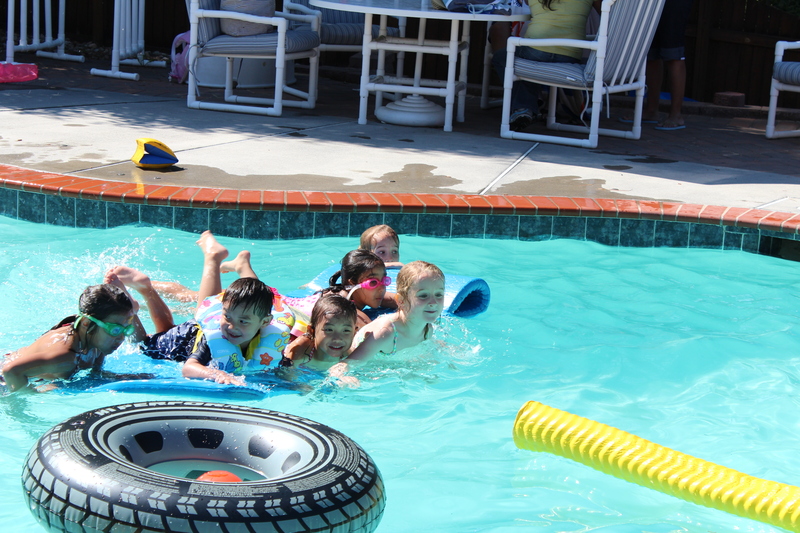 The girls couldn’t wait to throw on their swimsuits and eat hot dogs with their friends! What lovely pictures and good on you Olive riding all by yourself. I presume a Yard Sale is our version of a garage sale, you have not been there long enough to acquire items for selling?? What fun rummaging through the offerings. coatings of heavy frosts, very picturesque. but freezing! !